Conversion control box for photovoltaic units. Installed on an energy storage unit from photovoltaic panels, this control box converts the energy produced into distributable current. 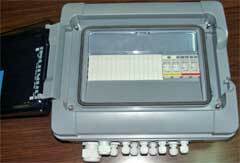 ABS control box with customisable transparent door.